Three of the firms that Tysdal’s fund invested in. The investors in a Cherry Creek private equity firm have turned on their former fund manager, saying he mismanaged $23 million they placed in his care on startups to benefit himself and his family members. Nine limited partners in Impact Opportunities Fund are suing Harvard Business School grad Tyler Tysdal, Tysdal’s new private equity firm TitleCard Capital 1Fund, the entity Tysdal used to run IOF and Cobalt Sports Capital, a short-term loan startup for athletes and entertainers that Tysdal backed. The ex-clients took Tysdal and company to Denver District Court in October, asking the judge to put 1Fund and Cobalt in receivership to protect what’s left of their investments and prevent both from taking on more investors. They say Tysdal and 1Fund still owe them $13 million. Tysdal and his co-defendants say the investors are trying to squeeze fast cash out of a $31 million fund that was only three years into a 10-year time horizon. “It would be inappropriate to comment before the legal process works itself out,” the statement said. Meanwhile, receiver C. Randel Lewis on July 28 won court approval to depose Tysdal and to issue subpoenas for more information about the various investments (view spreadsheet here). Lewis also is looking to wind down portions of Cobalt and is marketing the rest to be sold. Tysdal’s former customers say he targeted 30 percent annual returns, but instead lost large chunks of principal on poor investments. Among the ex-clients suing Tysdal are Colorado businessmen like Steve Kris, a private equity investor and principal at Conundrum Capital, and Craig Ponzio, an art colle ctor and philanthropist that built a 260-acre ranch in Evergreen. The plaintiffs allege that Tysdal directed Impact Opportunities to invest $19 million in three Denver startups in 2011 and 2012, then sold them for a nominal $100 apiece at the end of 2015. Tysdal has a family connection to at least two of those companies, the aggrieved investors say. They claim Tysdal used IOF to pour $13 million into a spa chain called AOB MedSpa run by his sister. AOB MedSpa has gone from 11 stores to one location in Greenwood Village and the receiver sold the business in March. And former investors say Tysdal’s wife, local morning show host Natalie Tysdal, indirectly benefited from Impact Opportunities Fund’s $1 million investment in Banner Media Group. The investors claim Tysdal lined his pockets at the expense of his investor clients. They claim he charged them a quarterly management fee of at least $600,000 a year and then double-dipped by collecting fees from IOF portfolio companies. Tysdal is a Harvard MBA whose resume includes a stint as managing director of Ken Tuchman’s billion dollar Mantucket Capital private investment firm. 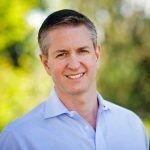 Tysdal left IOF in 2015 to start TitleCard Capital 1Fund, which purports to use celebrity endorsements from the likes of Jimmy Kimmel to promote portfolio companies. At IOF, Tysdal notched at least one win. According to quarterly reports included as exhibits in court documents, the fund in 2013 paid $1.2 million for a 1.2 percent stake in Four Winds Interactive, a digital technology company based in Denver. IOF sold its equity at the end of 2015 for $1.8 million, an agreement filed in court shows. Investors also had high hopes in portfolio company Cobalt Sports Capital. The plaintiffs allege that IOF pumped $3.4 million into Cobalt and that some plaintiffs later agreed to lend the company an additional $7.6 million. They even thought they could earn a profit flipping it, consenting to a deal to sell the business to Tysdal’s 1Fund for $16.7 million after a four-year hold. Now plaintiffs say Cobalt, which had previously financed loans to sports figures and entertainers, secretly used their money to prop up other portfolio companies. 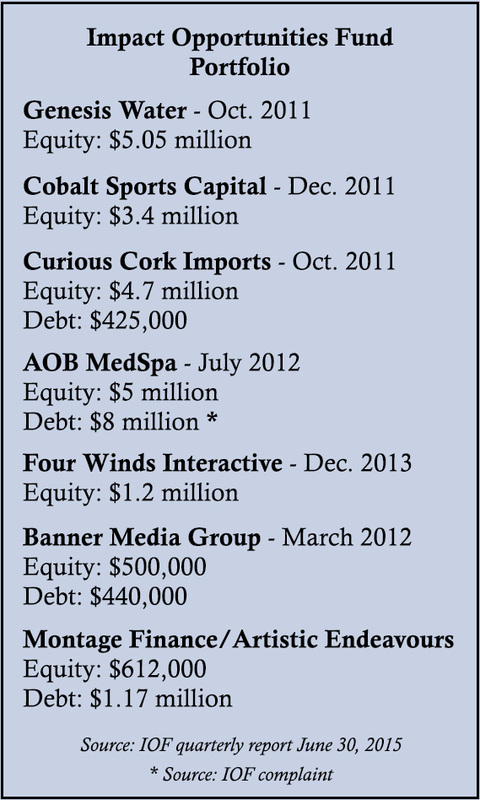 In particular, Cobalt made loans to wine distributor Curious Cork Imports, AOB and Banner. The AOB and Banner loans were written down to nothing. 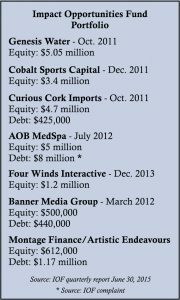 The Curious Cork debt has been converted to equity. And the ex-clients believe Cobalt is insolvent. They say Cobalt has taken out loans totaling $30 million, upon which it owes $3 million in interest this year. But Cobalt has loaned just $15 million to its own customers and will earn $2.7 million in interest in 2017, the plaintiffs say. The plaintiffs are represented by Thomas J. Krysa, Steven E. Abelman and Patrick B. Hall with Brownstein Hyatt Farber Schreck. Tysdal claims investors are merely acting as proxies in a dispute between him and a former business partner, Timothy Ulfig, who is the plaintiffs’ investment advisor and a managing partner at Cherry Creek Family Offices. Tysdal sued Ulfig, Cherry Creek Family Offices and his aggrieved investors in December. More recently, Tysdal and related firms have taken a swing at the receiver appointed to oversee 1Fund and Cobalt, which was used as collateral in a deal to roll over funds from IOF to Tysdal’s new fund. They say Lewis, the receiver, has no right to depose Tysdal or to subpoena more detailed documents about the operations of Cobalt and 1Fund. “A receiver has not been appointed over Mr. Tysdal personally,” the pleading filed July 2 reads. The defendants are represented by Livingston Keithley with The Overton Law Firm in Lakewood. Lewis is represented by Caroline C. Fuller with Fairfield and Woods. But Denver District Court judge J. Eric Elliff rejected Tysdal’s plea. Last week, Elliff ordered the defendants to follow the receivership order and allow Lewis to search its servers. And Elliff gave Lewis the go-ahead to depose Tysdal and send out subpoenas.